The tack score – Distance Lost to windward (DLw). This number is used by the OS5 BET diagram which tells you whether or not to tack on shifts. How well you called the laylines. Especially whether you had to pinch, or worse yet, short-tack to make the mark. You can zoom in and out, and move the boat around the course by clicking on the chart. 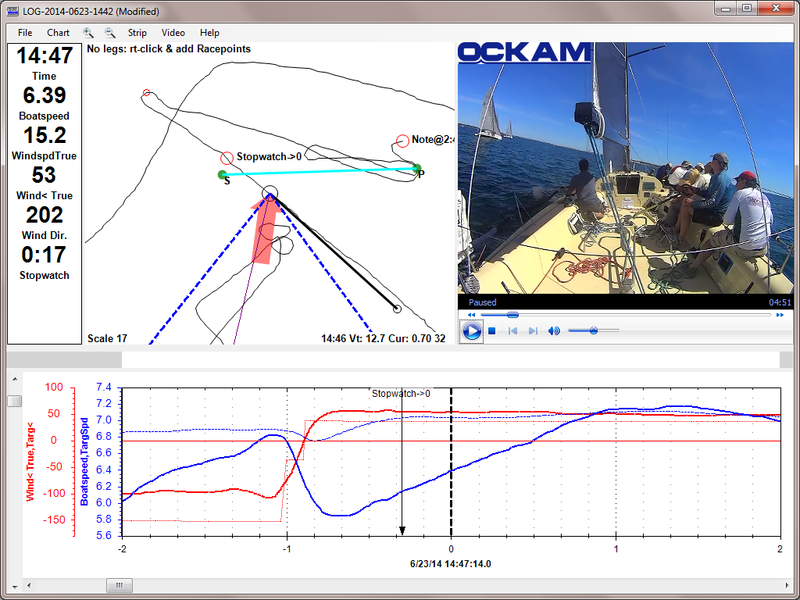 The stripchart remains in sync with the boat’s location. 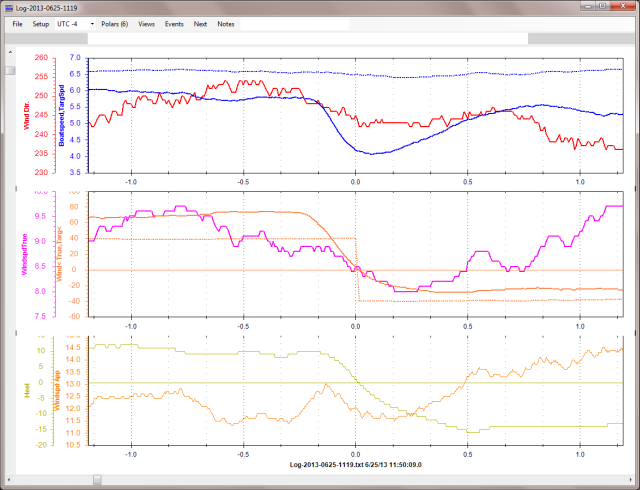 The stripchart view shows the variables over time. Any number of variables can be included on up to 4 strips. An important part of the strip view is the Events items. Here you see a tack event along with its analysis. The tack analysis provides metrics of exactly what happened during the tack. DLw (Distance Lost to weather). This is the bottom line metric – the amount of distance to weather the tack cost. The true wind stats including shear and wiggle (the indicator of how good your calibration is). 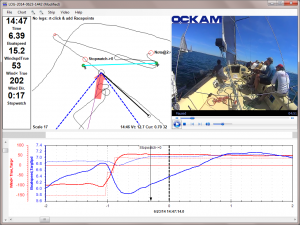 The timing marks; head to wind, the point of lowest boatspeed and highest true wind angle on the new tack (and how much), and the length of the tack. 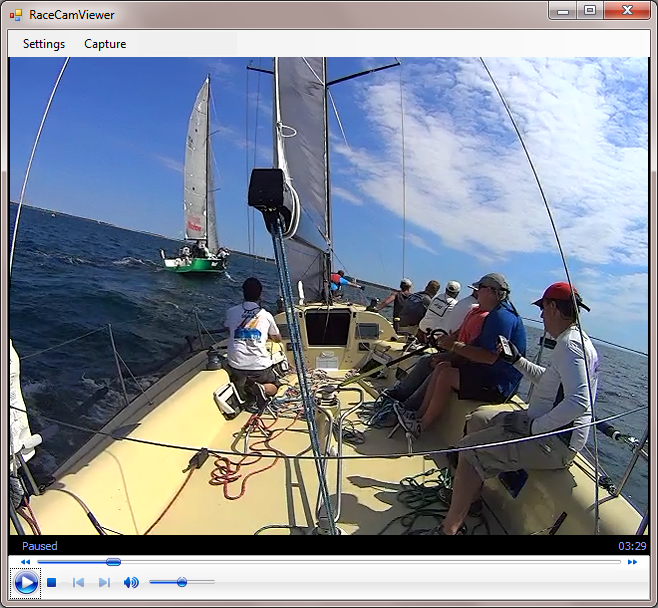 RaceCam is a video camera and processing application that records and analyzes a video of your race. There are many ways to record the video for processing, such as a GoPro or “IP” Surveillance camera. Having a video of your race aids in finding out why what happened happened. In addition to finding out what happened, having a video of your race can be useful in a protest. 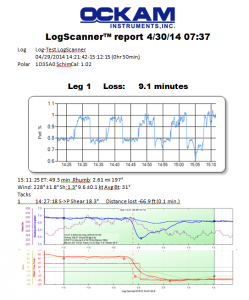 LogScanner produces a word document summarizing the log file and its events. Each leg’s performance summary, analyzed tacks and any added notes are listed. Since it is a word document, you can edit it to add commentary after LogScanner produces it. 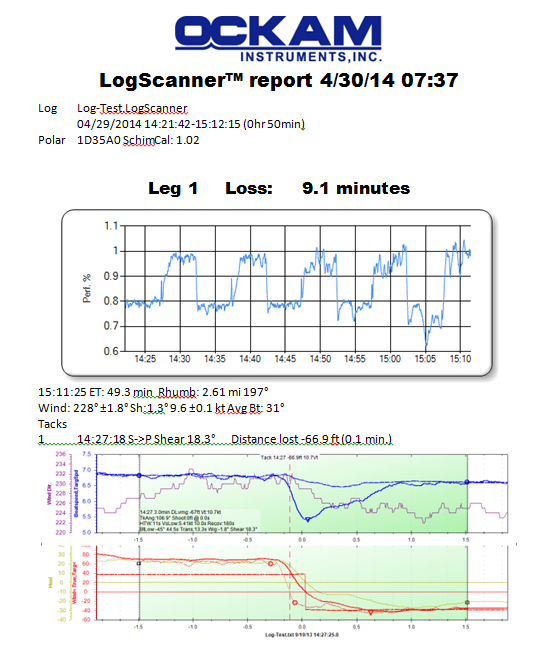 Since the LogScanner output is produced by a robot and not a knowledgeable human, it doesn’t include any insights. That’s your job. You can add notes to the log and they will be included in the report. Otherwise, the report is just a bunch of measurements and pictures. The development of LogScanner is an ongoing process, and describing how it works and how to find those insights you are looking for means we will break the how-to into separate posts.